I’m very proud to finally offer this tutorial – it’s been a long time coming, and alot of hard work. I’ve taught wire wrapping in person for many years, but writing instructions for someone I will not be teaching in person, has been to say the least challenging. My style of writing is not as ‘formal’ as some, but after much consideration and countless re-writes, I realised I needed to stay with what I know best. 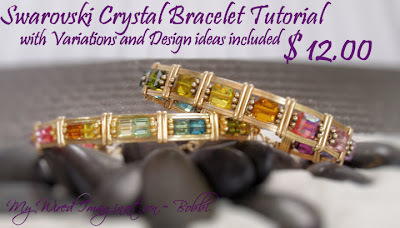 This tutorial is written as if I were teaching you in person, as much as possible – since I’ve taught this in person, I know the pitfalls you’re most likely to face, and do my best to head them off -The bracelet in this tutorial is my personal favorite. It was inspired partly by my birds, my Rainbow Lories ~ Murphy, Gabby, Pluck & Feather, in particular. Everyone that I’ve taught this to, and who has made one, interprets the colors in their own way ~ as it should be. Other beads can be used for this, in an infinite number of combinations however, square beads are easier to manage in the beginning. The techniques I’ve developed, and teach in this tutorial, create a stable ‘tough’ little bangle; and unlike some other ‘versions’ of this style, the means to create a bangle at near perfect to perfect length. After we have completed the basic style, I will walk you through an additional (really cool) variation, plus some other design ideas.Materials to create a basic 7 -7 1/2″ bracelet: I prefer GF wire, but you’re welcome to use sterling or even copper – ½ hard or dead soft. Q=the best to use? A=Use what you have.• 48″ 20g square wire • 9″ 22g wire (square or round)• 32″ 16-20g ½ round wire (I prefer the heavier gauges in ½ round wire, and ½ hard for this project – it forms crisper wraps)• Minimum 12 6mm cube crystals• Optional : 2, 4mm Bali spacers per crystal, if you don’t use spacers, you will need to increase the number of crystals needed, by 2 or 3; 1 extra cube as a ‘little helper’. Tools: wire cutters, ruler, flat-nose pliers, round nose pliers, large round dowel or something similar for forming – optional: tape, Sharpie marker, cleaning cloth. This is a PDF file – To view this tutorial you will need a free copy of Adobe’s Acrobat Reader, which can be downloaded here:http://www.adobe.com/products/acrobat/readstep2.html, however most computers with basic programming are already capable of reading a pdf file. This tutorial, and others can be purchased from My Shop at Etsy. Thank you for stopping by – please visit again…………………………………. ← Makes Ya Wanna Go Hmmmmmmm…….